Leading the charge for the Democrats on the impeachment front is Steve Sherman (D-CA) and Al Green (D-TX). Their Articles of Impeachment are a re-introduction of the last Congress’ Articles of Impeachment, except this time there is a Democrat majority on the Judiciary Committee and a comfortable Democrat majority in the House. If Democrats stick together, as Democrats typically do, then they have the votes for impeachment, which will never result in a conviction in the Senate, but it will, without question, further damage a President bludgeoned daily by the Democrats, the mainstream media, Hollywood, and even a handful of Republicans. 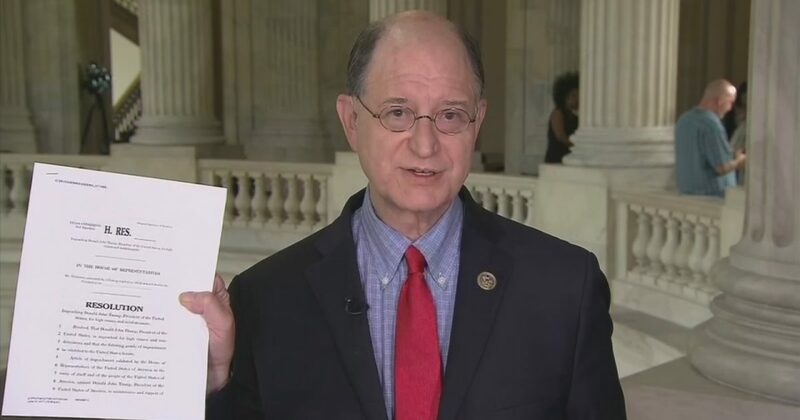 When asked by a KABC reporter about the near-immediate re-introduction of Articles of Impeachment, Sherman whined, “Unsurprisingly, Republican leadership did not hold hearings on the Articles of Impeachment, H.Res. 438. In any other era during America's history, those who would do what Democrats are doing today would have been considered traitors, or at least seditious co-conspirators. They are openly attempting to depose a duly elected president and no one seems to care. What are you talking about, Mikey? Barack Hussein is no longer in office. Stopping the wall will help the country. And stopping trump will stop the wall and help the country. El Chapo had no problem digging tunnels out of his jail cell. A wall won’t do a damn thing except waste taxpayer money we can’t afford to waste after the #GOPTaxScam. Furthermore, the wall will cost a fraction of the annual cost of illegal immigration.